One of the best parts of my job at Lumen Learning is the opportunity to meet the extraordinary people who are choosing to be flag-bearers for open education. During the age of chivalry, champions were knights who fought for a cause on behalf of others. This definition of “champion” applies perfectly to the cause of open education. Our current-day OER champions are those who dare to blaze trails for others to follow. Many of these champions create and curate learning materials for others to use and build on. Other champions do the hard work of making the case for open education, building believers, and creating support systems to sustain and grow the impact of OER at a college or university. 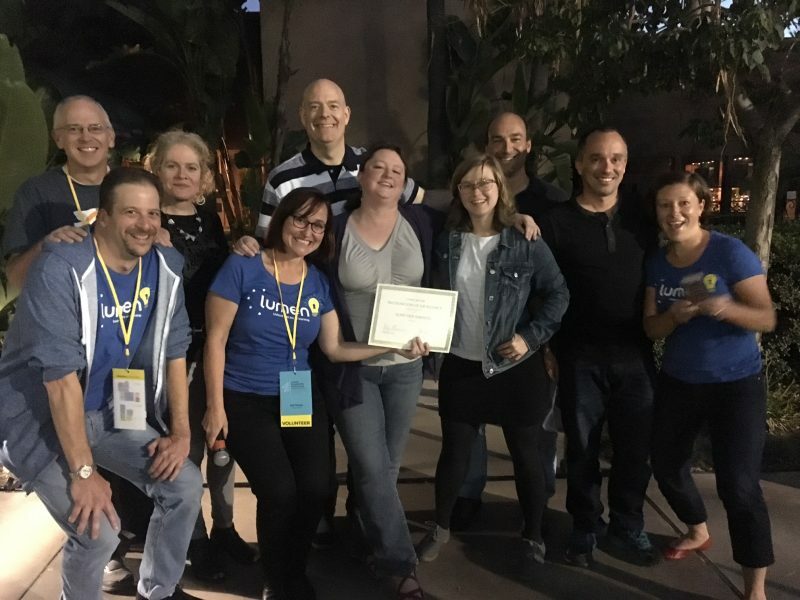 Because our work creates many opportunities for close collaboration with OER champions, Lumen has been in a privileged position to see and help support many different activities associated with evangelizing for OER. These experiences have created a treasure trove of ideas and expertise around building effective OER initiatives. Earlier this year we began compiling these ideas into a single, sharable resource that could be helpful to anyone engaged in an open education project. The framework we eventually settled on is a digital “Playbook” – a set of tactics and activities designed to help OER champions strategize, score, and win at successful, sustainable OER adoption. We first test-drove the OER Champion Playbook at a couple of events earlier in the summer. After receiving enthusiastic feedback and ideas to help further expand this resource, today we’re officially introducing the Playbook to the world at large. Check it out! You can browse the Playbook for ideas, tips, how-to instructions, examples, and tools you can repurpose to plan and execute your own strategies aimed at achieving your goals for OER adoption. We’ve also created a companion tool, an OER Champion Workbook that walks through a step-by-step process for planning and executing an effective OER initiative. If you share your email address with us when you enter the Playbook, we’ll send you a copy of the Workbook as well. The Playbook is a living document. We’ll continue adding to it as we collaborate with, learn from, and support many and diverse champions for OER. We’ll continue collecting and attributing wonderful resources we encounter along the path supporting OER adoption. Do you have a suggestion or something you’d like to contribute? Send us feedback using this form. It’s inspiring to witness remarkable persistence, creativity, and energy focused on helping students and faculty realize the benefits of open education. And it’s really fun to share these things through the OER Champion Playbook. Photo: The SUNY OER Services team receives recognition for outstanding efforts at a 2017 Lumen Client Appreciation event.